The final event of the project was a two-day conference, which took place at BMAG at the end of May. Over 60 people attended over the two days, and we had 27 speakers from all over the world, plus two excellent keynote speakers: Professor John Holmes (University of Birmingham) and Dr Dinah Roe (Oxford Brookes). I’m happy to say that the event was a great success: as well as a range of fascinating and varied papers which really brought out some exciting aspects of Pre-Raphaelitism, we also had a wonderful tour of the stained glass windows by Burne-Jones in St Philip’s Cathedral, and a really outstanding reading of Pre-Raphaelite inspired poetry by the Pre-Raphaelite Society’s poet in residence, Sarah Doyle, which took place, with a wine reception, at the Birmingham Midland Institute. I am enormously grateful to all those who attended, spoke, or helped out; the event wouldn’t have been the same without such a wonderful community of Pre-Raphaelite scholars and enthusiasts. The final Reading Art talk today rounded off the series nicely, with an excellent talk by Richard Schofield, Lecturer in Visual Communications at BCU. With particular reference to his work ‘I am still asleep’, a response to William Golding’s novel Pincher Martin, he discussed the ways in which an artist might respond to literature, raising some fascinating questions. This work, involving Richard’s immersion in the novel and creative responses to it, is not illustration; rather, he describes it as collaboration (with Faber & Faber’s agreement, if not Golding’s – though I’m sure the writer would have approved). Golding’s writing, often abstract in its descriptions, suggests atmosphere rather than concrete ideas, and it is these to which Richard’s work corresponds. An ‘unfixed, or floating narrative’, characteristic of his previous projects, also appears in this work, in text which swoops around the images, virtually transparent. The after-life of artworks […] transpires between a do-not-let-yourself-be-understood and a wanting-to-be-understood: this tension is the atmosphere inhabited by art. After all, if you want to say something, art isn’t the quickest way to do it – but it might be the most powerful, or creative: atmosphere and ambiguity work together to create this tension. This collaboration allows the artist to use the work of literature as a filter to express his own subjectivity, bringing to it all kinds of other approaches, emotions, interests, etc. As Richard pointed out, visual and conceptual ideas are fused in writing, using a palette of words, which generates ideas. But the words are mechanical, selected from a tool-box of language, while the paint is molecular, about expressing thought in a different medium. Richard’s latest work, ‘Slow Wet Tar‘, is on display at the Parkside Building, BCU, now. Poet Bethany Rivers, who is interested in ekphrasis and how poetry and painting are mutually inspirational, gave a reading and talk for the penultimate Reading Art lecture. She has been inspired by a number of Pre-Raphaelite paintings, which gave rise to a particularly interesting discussion about Millais’ Ophelia and the ways in which Hamlet inspired both the painting and Bethany’s poem. Bethany talked about ekphrastic practice, quoting Plutarch: ‘Painting is silent poetry, and poetry is painting that speaks’. The way poetry might describe a painting represents the poet’s view, of course, not every viewer’s image, and this potential for creating new images with words is a fruitful topic for a poet. Bethany read from her forthcoming book Off the Wall, which is entirely ekphrastic, and the audience enjoyed a lively discussion ranging from feminism to Shakespeare. Last week we had a fascinating talk as part of the project by Louise Chapman, Lecturer in Design for Performance at Birmingham City University. Louise discussed how ‘aesthetic dress’ isn’t all that it seems: while it was ‘oppositional, anti-fashion and sub-cultural’, it was adopted slowly and often with a hidden secret (hidden internal corsets!) The muted colours, drapery and medieval styles of the dressed in paintings such as Beata Beatrix, Lady Windsor and Proserpine tell us a lot about the artists who painted them and about the approach they developed which suggested a loose, free approach to dress, but as Louise (and Dr Robyne Calvert from Glasgow School of Art, who spoke to the Pre-Raphaelite Society on a similar subject recently) suggested, this approach was often an artistic performance rather than one which the models and artists perpetuated in their private lives. Louise’s talk generated some great discussion, and it’s difficult to look at the clothes in the paintings in quite the same way now! Then he went out; and as he went, he wept. We also looked at Emma Sandys’ Lady Holding a Rose, and discussed her representations of Arthurian women, followed by her brother Frederick’s depiction of Morgan le Fay. Finally, I talked about his Medea, which I’ve written about in more detail here. One of the most enjoyable aspects of these talks is that people ask such interesting questions; afterwards, I spoke to a number of people who had attended, including a clergyman, a researcher and an A-level Art student, which was wonderful; it’s fascinating to hear the different approaches people have, and to enjoy stimulating conversation about mutual interests. The next talk is this Saturday, April 16th, by Louise Chapman of Birmingham City University, talking about ‘Performing Aestheticism: Aesthetic Dress as Performance’. On Saturday the first of the Reading Art talks took place at BMAG, given by Maria Cohut, a doctoral candidate at the University of Warwick. I can’t possibly do justice to Maria’s talk in a blog post, but she explored the poem and the paintings which it inspired in a way which really encouraged me to think about the interpretative gap between poetry and paintings – something that Tennyson himself was well aware of, in his criticisms of the illustrations for the Moxon Tennyson, which he often felt weren’t sufficiently close to the details of the poem. For Tennyson, poetry was the defining art, then (as well as the first chronologically) and thus images inspired by it should be faithful to it. But for the painters inspired by the poem, their art was inextricably linked to that of the poet, but nonetheless separate; their own interpretation was significant to them. Maria’s readings of the poem and paintings bridged this interpretative gap creatively – and made me think about the Lady’s hair in a whole new light! Below are some of the images she discussed – some more familiar than others. 5.30 Drinks reception at Birmingham Midland Institute, with a poetry reading by the Pre-Raphaelite Society’s Poet-in-Residence, Sarah Doyle. Really fascinating talk from Richard Schofield this morning about artistic collaboration in art inspired by literature. 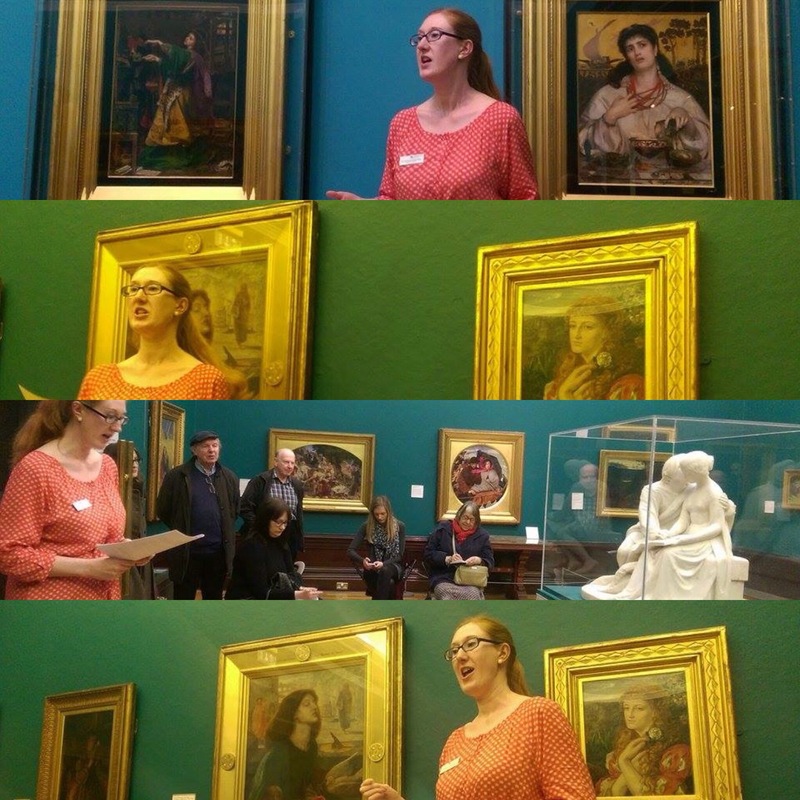 So much fun talking about #preraphaelite poetry and painting @birmingham_mag yesterday!